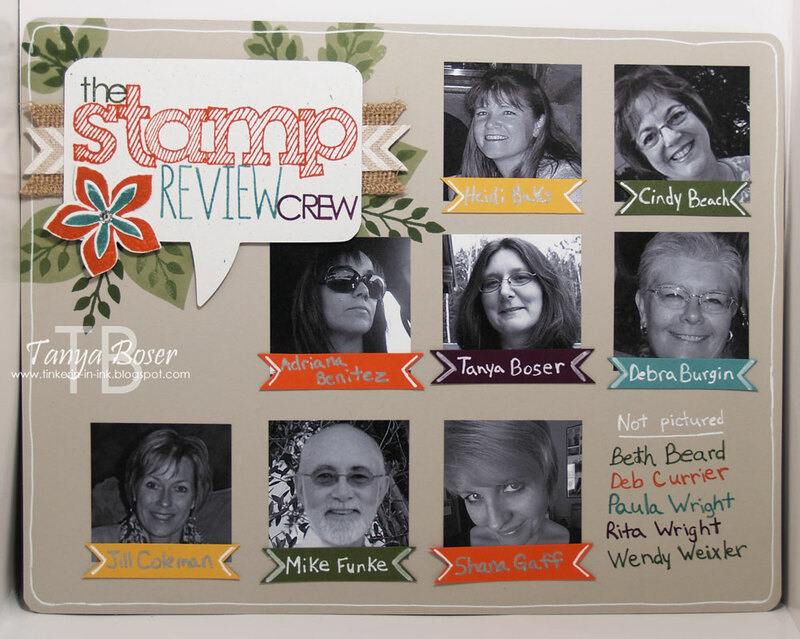 Welcome to another edition of the Stamp Review Crew! If you are visiting us on Sept. 1st, I hope you are enjoying your holiday :) This time, we are featuring a fun set of stamps that is almost all the same shape, and has a couple of coordinating products. There is Mosaic Madness, the stamp set, the Mo saic punch, and the Modern Mosaic embossing folder! 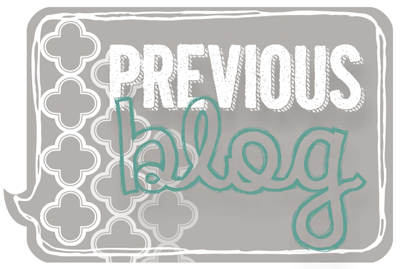 If you are following the hop in order, then you just arrived from Dawn's blog, Fab projects! 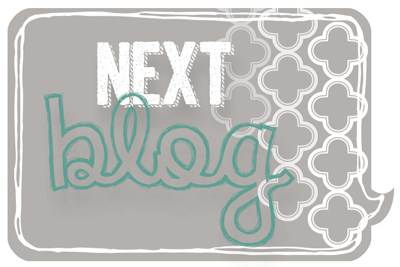 I am the last stop on the hop, so my "next" will loop back around to the first stop on the hop :) As always, you can find the blog roll on the StampReviewCrew blog and that the links always take you directly to the posts you are looking for. If you have missed any of our hops, you can go back and hop through them at any time! My first project is a very simple, one layer card. I know, so unlike me! But I had stumbled on a card I had made with Hearts a Flutter that I had done something similar with and gave it a try. I hope you like it as much as I do! Now, you can go see what Kerry has created! Have a great Labor Day! 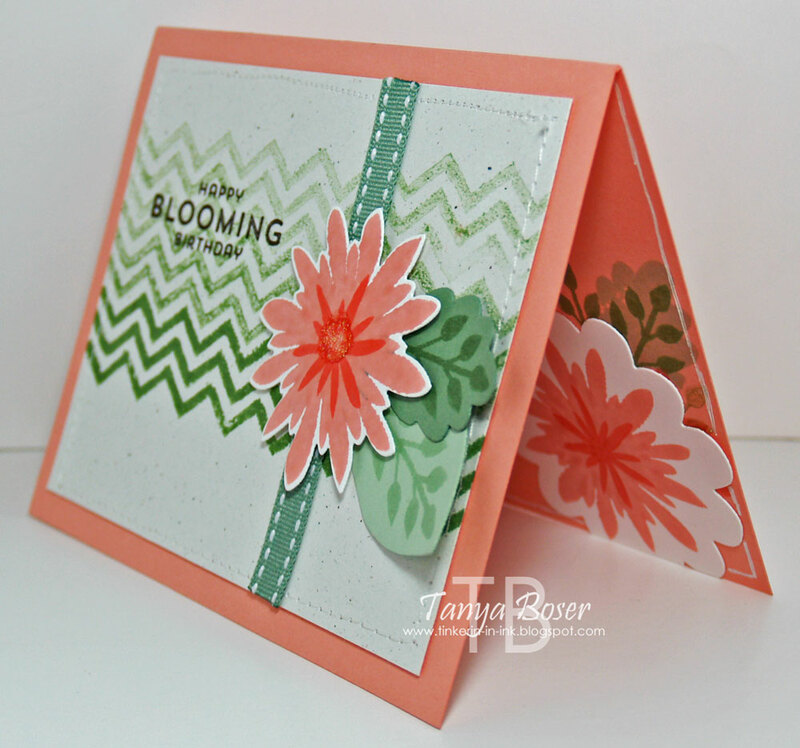 If you are following along in order, then you just arrived from Tina's blog where she featured the Color Me Autumn DSP. So pretty, right! 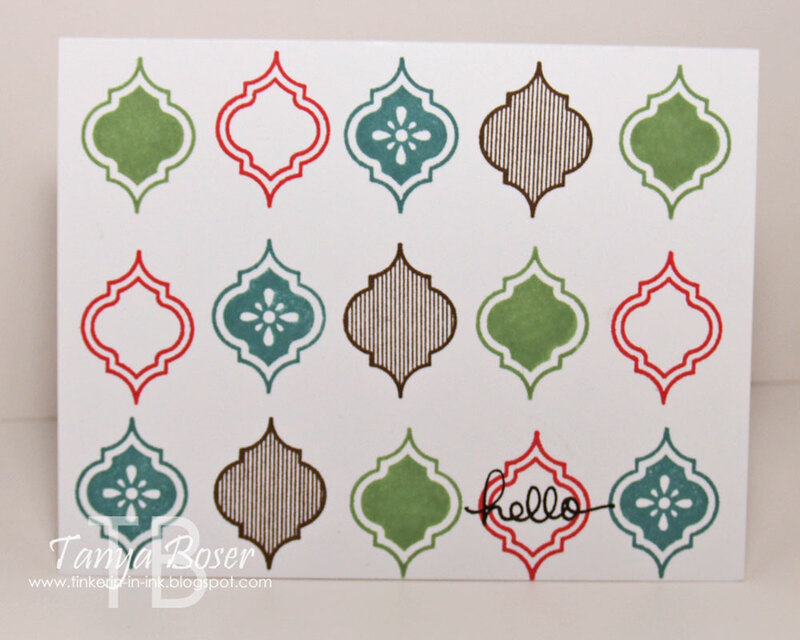 And if you get lost, simply go the Stampin' Addicts chat thread for this hop to get back on track, or just to chat! 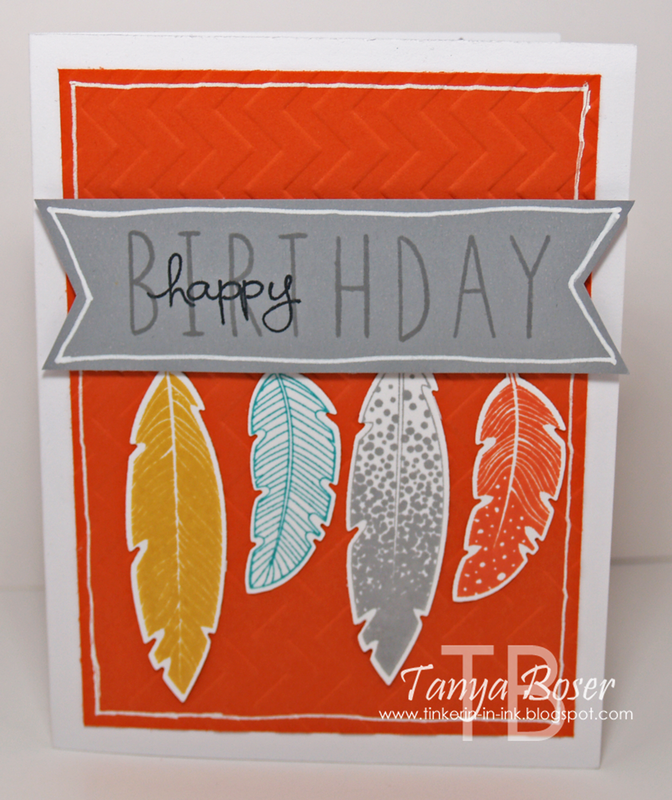 My first project is a birthday card using the Four Feathers bundle. I used the Skinny Mini Alpha stamps to make the "BIRTHDAY" and the "happy" is from Endless Wishes. 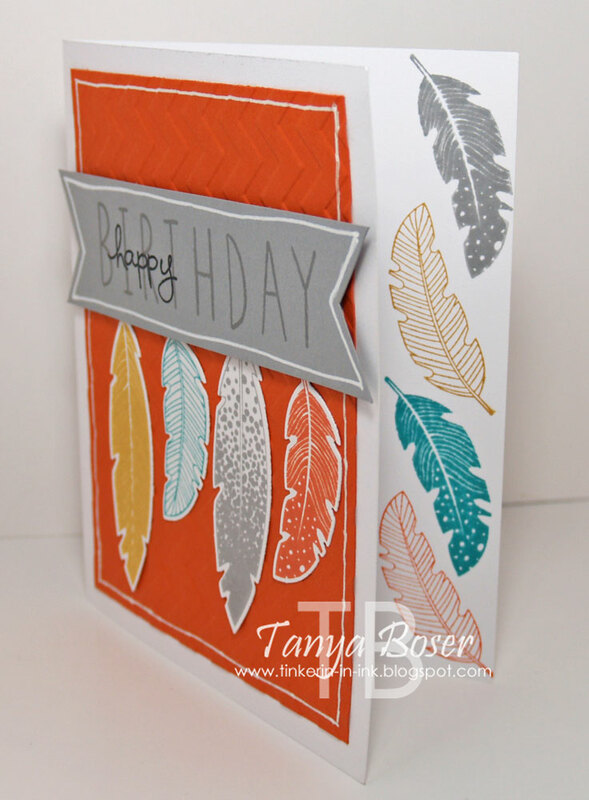 I stamped some more feathers inside the card also to finish it off. 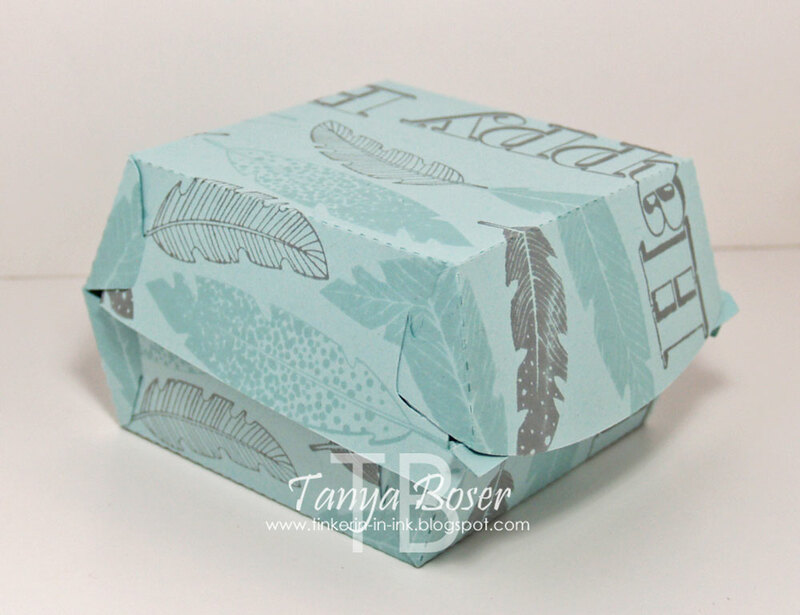 Next up is a hamburger box treat box. I simply stamped the box before assembly. My last project are these cute little thank you cards. I made them in 2 sizes, 3x3 and 2½x2½ to use all the scraps from the 8½x11 paper I cut them from. First I brushed some color onto a piece of watercolor paper with an Aquapainter and the coordinating ink color. I let that dry and then I stamped the feathers in Smokey Slate and the "thanks" in Black. Here are the Hello Honey versions. And the Strawberry Slush versions. I really love how these turned out! Wow, summer is nearly over. 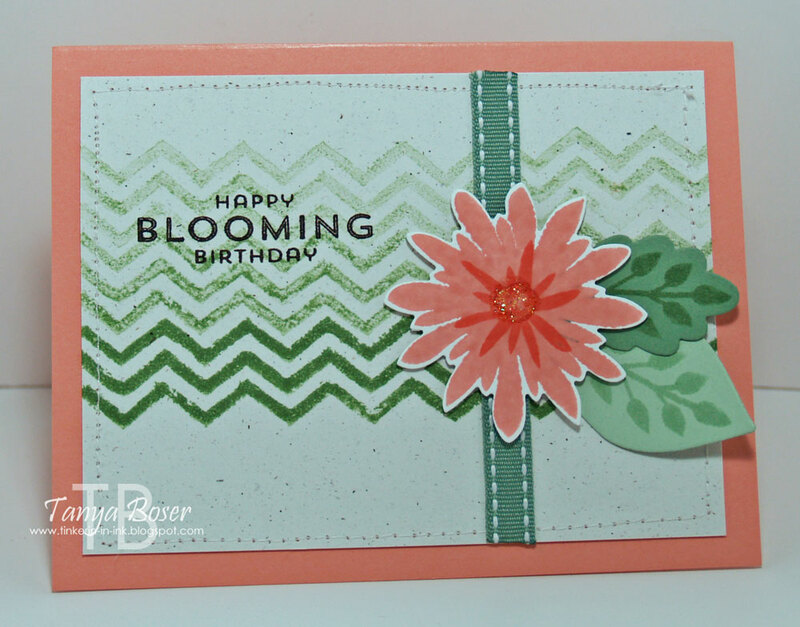 We still have a little more time for "daydreaming" though :) This edition of the Stamp Review Crew is featuring a fun collection of fancy circles that just so happen to coordinate with the Floral framelits. Now, we pick out our set months in advance, so it is just a coincidence that there is a Big Shot Bundle special going on right now. But, isn't it convenient! 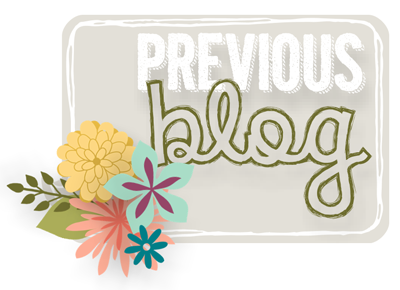 As always, you can find the blog roll on the StampReviewCrew blog and that the links always take you directly to the posts you are looking for. If you have missed any of our hops, you can go back and hop through them at any time! 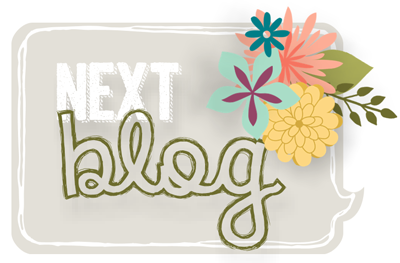 If you are following along in order, then you just left Lisa Young's blog-isn't she amazing?! I am stop #8, and I am typing this when I am supposed to be packing stuff up for our vacation trip to a lakeside cabin! Yes, I am a procrastinator! Here is my idea. I embossed the Crumb Cake panel with the new Polka Dot embossing folder, then stamped each raised polka with the smallest medallion. Then, I wanted a really big "hello" so I pulled out my Epic Alphabet set. Being able to see through the stamps makes it a breeze to spell things out and have them line up! LOVE that! I used the Fringe scissor to give it a little jazz. Inside, stamped more medallions along the bottom of the card. And hopefully on this picture you can see the embossing! Now it is time to go see what Paula has in store for us! We are back with the other half of the projects we made for our display board at convention, plus a few that just did not fit on the board :) We don't usually feature any brand new stamp sets, so this is a special occasion. 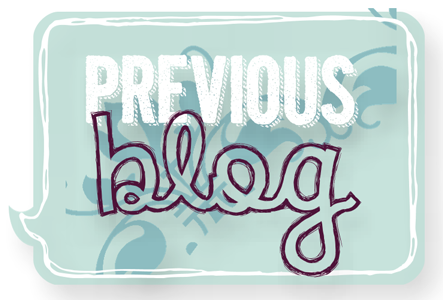 And remember, you can always find the blog roll on the StampReviewCrew blog and that the links always take you directly to the posts you are looking for. If you have missed any of our hops, you can go back and hop through them at any time! 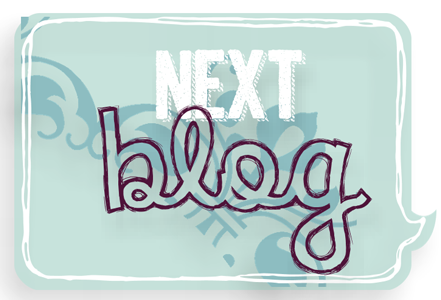 If you are following the blog in order, then you just arrived from Kerry Willard Bray's blog, love her stuff! Or maybe you came from Wendy Weixler's blog? She is a late addition to the hop and there may be a slight glitch in the blog roll this morning :) And I have a few projects to share myself! This is page one of a two page layout. 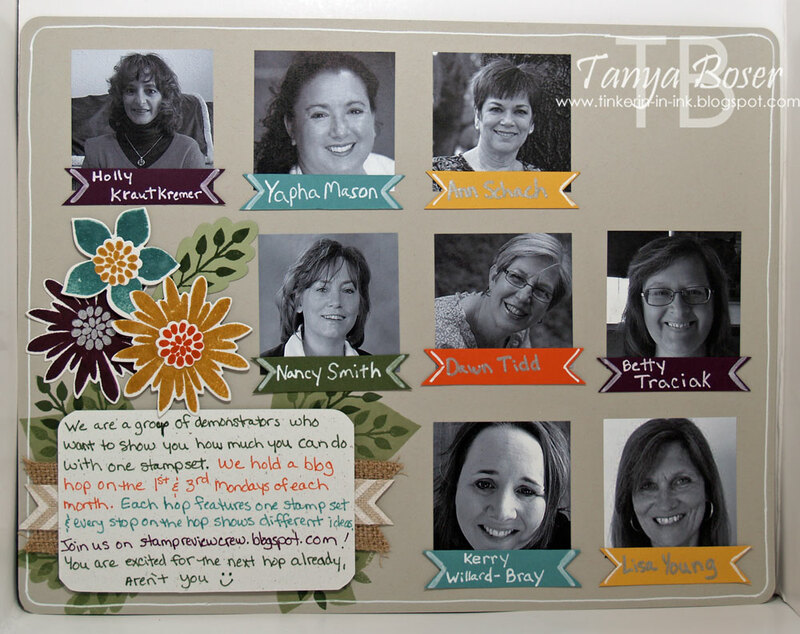 I wanted a layout with the "headshots" of all of our members on the board. You will notice there are a few "not pictured" names. I had to have a signed photography release form for each of the people pictured in order to use it on the display board. And this is page two! I love seeing all of those wonderful faces together, don't you?! Now I just can't wait for the opportunity to meet them all in person :) I already know several of them personally, but not all. How about a quick and easy card. This is another of those cards that popped into my head and into a card in 10 minutes! I really love it when that happens :) This one made it on the display board too. The next bunch of projects did not get done in time for the display board, but I was on a roll with this set! 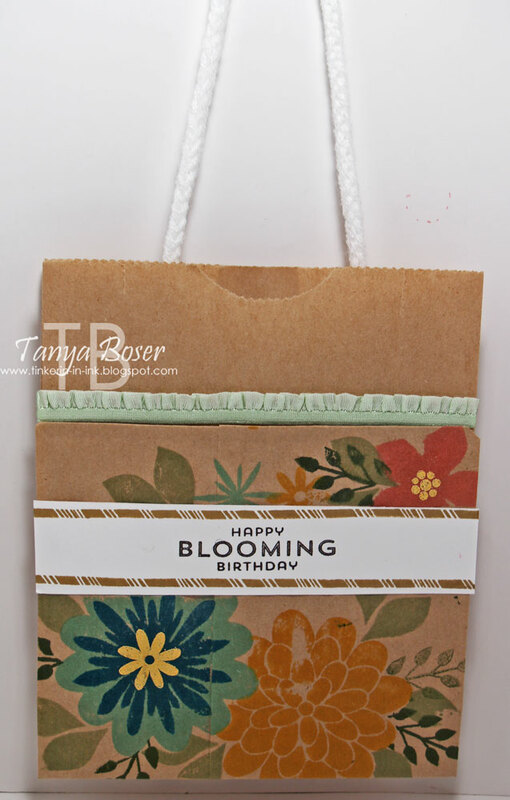 I know that I have made these little treat/gift bags before, but they bear repeating. 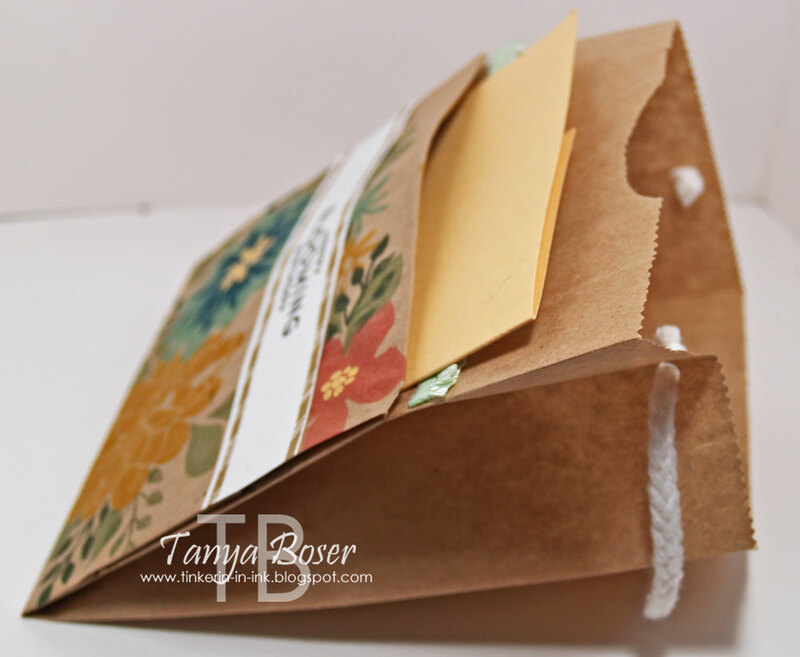 This is a lunch sack folded with the edges adhered to create a front pocket with a bag. First I stamped the sentiment with the borders. 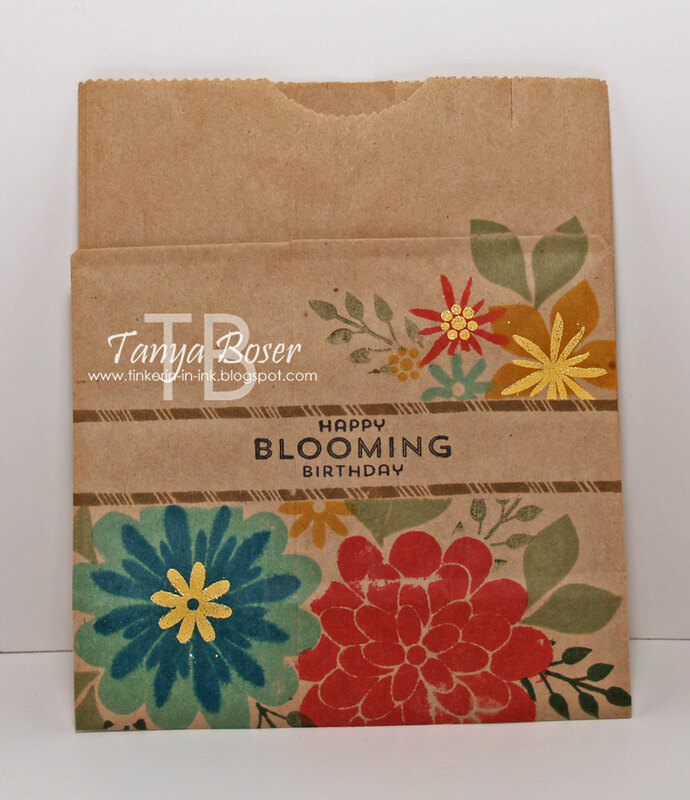 Then I masked it off and stamped a variety of flowers, then I added a few Crushed Curry embossed flower centers. I am so excited about this embossing powder, by the way! I have wanted a vibrant yellow embossing powder for a long time :) Actually, this is the second one I made. The first one I made, I dropped an inked up stamp on and ruined it.... oops! Here is a side view, so you can see the bag part filled, and the fact that an A4 card will fit in the front pocket. This is the third bag I made, and I added a couple other details to this one. I added some retired Ruffled ribbon and Sweater trim as a handle, and a white strip for the sentiment. This one has a different combo of flowers, which I think I like better. I know, this post is getting really long. Hang in there, this is the last project. I love the fun feel of this card! Chevrons are still very popular, and a little ombre effect to go with it. Ok, now it is time to head over to the next stop, Nancy Smith! 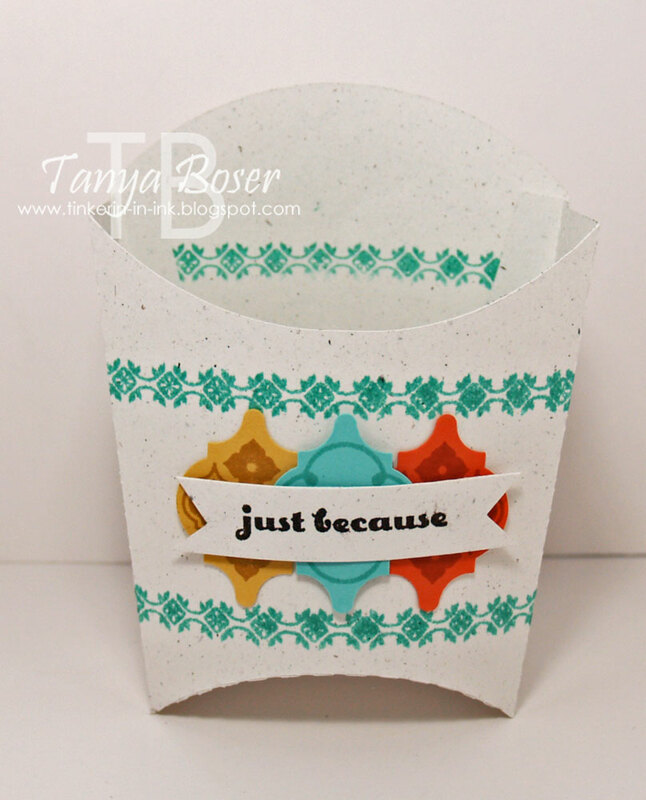 Papercrafting is my relaxation, and I hope to inspire you to create your own. Or at least get a chuckle out of you! This blog and its content is my sole responsibility and the use of and content of the classes, services, or products offered on this site is not endorsed by any other entity. Images used on the products are copyrighted by the companies that produce those stamps. 2017 Tanya Boser . Simple theme. Powered by Blogger.